Emotion is a mobile-based app intended to help users improve their understanding of depression and to assist users in their recovery. 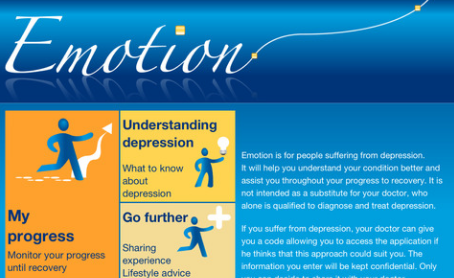 Emotion provides users with psychoeducational information (text-based) about depression and offers steps users can take to overcome it. Additional features include the recording of users’ current state and graphical presentation of their state over time; testimonies from former patients with depression and their families; suggestions of things to do that could assist with recovery; relaxation videos; reminders to fill out questionnaires; and the option to send reports to the user’s clinician.